Notify orders department - tick this check box if you want to notify the store administrator about placing the order with this status. Increase – means that the product number will not be changed in stock. Decrease – means the status will affect the inventory. 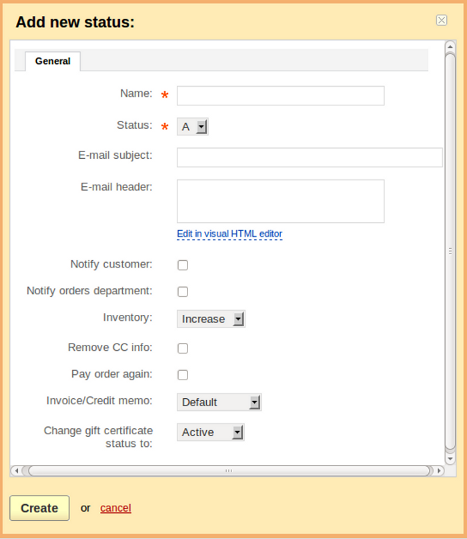 Tick the Allow a customer to pay the order again in case the transaction was declined check-box. Invoice/Credit memo – determines the condition of the order after receiving this status. Choose one of the following options. *Consider the fact that in case a realtime payment method is set up in CS-Cart, the Remove CC info option should be disabled for the Open status. When a customer clicks on the Place order button, the order is registered in your CS-Cart as Open and after that the necessary information is passed over to a server of the payment method. But if the mentioned option is enabled, the credit card information is passed over as XXXX, the error will occur. "What a joy to find such clear thinking. Thanks for ptosing!"